April 9th, 2006: Warm, overcast, and windy. A possibility of rain was forecast, but as I write this we haven’t had any - in fact there has been a fair amount of sunshine since about mid-afternoon. A lot of snow disappeared overnight; the temperature only went down to about +4. Last Sunday, the willows east of our place were loaded with pussywillows. Of course, those silly things will pop out in the middle of winter, if it turns warm for a bit. Our first junco showed up last Monday and now there are lots of them. Still no sign of red polls, though, and they should be here in the hundreds. Our first purple pooper (aka purple finch) showed up on Thursday, but just one. Frank Duhaime, long-time maintenance supervisor at the Park, retires this month. Last Monday, he brought his successor, Gordon Locke, to coffee row. It must have been a bit overwhelming because there were about twenty at coffee, all giving him instructions on what his priorities should be. Gordon and his family will be living in the Park and we welcome them. On Thursday, I walked down to the Marina. 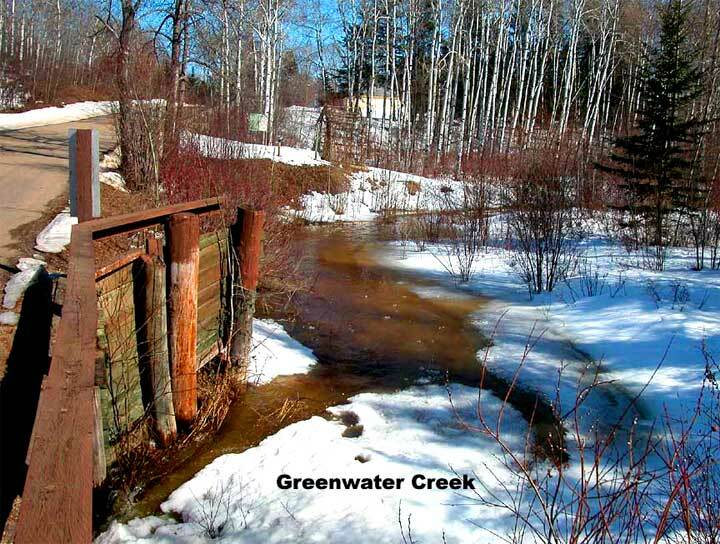 Greenwater Creek was flowing strongly into the marina and the ice was quite wet. On the lake, the ice has turned very dark, which means the snow is saturated with water. With less ice than normal, but more snow, will breakup be earlier or later than normal? Watch this space! I watched a couple of geese on a patch of bare ground; one had its head up, looking around, and the other was pecking away at the grass. I guess they must find something to eat. There was what I think was a merlin, screaming and flitting about in the trees over at Gustus’ place. I only saw one, and I think they usually hunt in pairs. The other was likely perched quietly in the trees, waiting for a bird to break cover. We saw several hawks along the road to Tisdale, but couldn’t identify them. One was carrying a bunch of dead grass. Connie and Gary Schmidt have been working hard at the Beach Café. I understand they are completely reworking the dining room part, including moving the entrance door to the south side. That should give them a fair bit of extra space. Connie says they hope to open the first week of May, but it depends on how soon their water lines thaw out. I will try to get down and get some photos before then. Rose tells me she is planning to open the Park Store on May 18th. The Cove had their first smorg today, and Jerry tells me it was a huge success. The smorg was in two parts - a brunch from ten to two, and smorg from four to seven. However, it was seven-thirty that I talked to Jerry and he said people were still coming in! Look for it as a regular feature from now on. 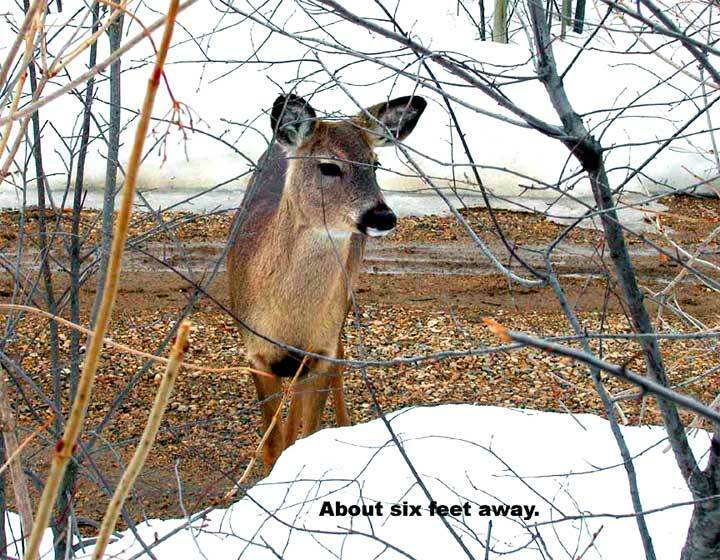 There must be about seven deer wandering around in the Park. They are regular visitors to our place, cleaning up sunflower seed shells under the bird feeders. We shouldn’t have to fertilize our lawn this year. We drove into the yard the other day and a small deer was wandering around in the other driveway. It didn’t seem at all nervous, though it was less than ten feet away, and we were making lots of noise slamming doors, etc. I grabbed a photo of it. The Adams’ are back. Burl tells me he had a block of salt out all winter, and the deer visited it regularly, apparently digging through the snow for it. Since he got back, he has been putting out some sunflower seeds and alfalfa pellets for the deer; it didn’t take them long to find it. I can’t say the deer look particularly malnourished, but several people in the area have been feeding them. Merv told me that sometimes a new deer will come to the bales looking very skinny, so maybe things aren’t all that good back in the bush. 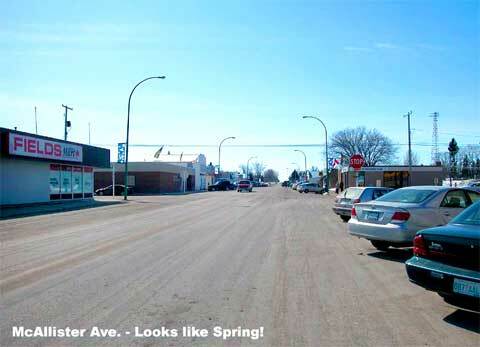 Driving into Porcupine Plain, the north end of McAllister looked as if the snow was all gone. Farther south, though, and on Katherine St. there was lots of snow piled up. 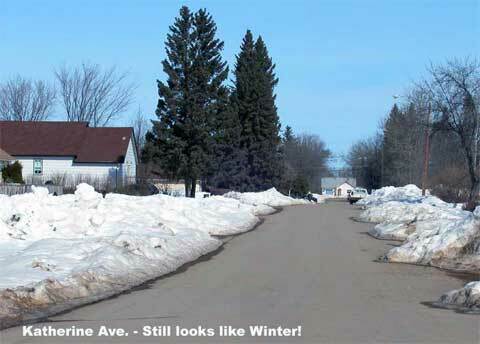 I must say the Town of Porcupine Plain did a marvellous job of keeping their main street clear of snow. There was a couple of times they had a windrow down the middle of the street, but it was hauled away quickly.